This paleo granola recipe is swell for on-the-go breakfasts, any-time-of-day noshes, midnight munchies, and all manner of stroller snacks. And you won’t find a single rolled oat it it. Or speck of grain. Or smidgen of butter. What you will find, however, is lots of nuts and sweetly crunchy goodness galore. 1. Preheat the oven to 275°F (135°C). Line a rimmed baking sheet with parchment paper. 2. Roughly chop the almonds, cashews, pistachios, and hazelnuts. Combine the chopped nuts with the coconut and pumpkin and sunflower seeds. 3. Combine the coconut oil, honey, vanilla, cinnamon, and salt in a small pan over low heat, stirring until well combined. Pour the warm liquid over the nut mixture and stir to coat. 4. Spread the granola mixture evenly onto the prepared baking sheet (it’ll be 1/2 to 3/4 inch thick or so) and bake, stirring every 15 minutes, until lightly browned, about 45 minutes. 5. Remove from the oven, stir in the cherries and citrus zest, if using, and spread the granola evenly on the baking sheet. Let it cool completely, about 30 minutes. The granola will harden slightly into a brittle-like consistency as it cools. Paleo Granola Recipe © 2015 Lea Hendry Valle. Photo © 2015 Lea Valle. All rights reserved. All recipes and photos used with permission of the publisher. I think granola just found it’s way back into our kitchen with this recipe. Normally granola is a treat—something we might buy or be served when traveling, artisan-made in small, paradise vacation locales with tropical fruits, nuts, or some other local twist. A small bit comes home, a last taste of vacation, but then we go back to our no-granola pantry. We made muesli at home for years, until we gave it up (raw oats didn’t agree with me) and since then we're pretty much a no-cereal household. But this granola is almost like a praline, though not as sweet. And that definitely has a place in our lives, maybe as a topping on fruit and yogurt for breakfast or some thick Greek-style yogurt or other dessert-like rice pudding or, dare I say, ice cream! So while it wasn’t so important for me that this be a paleo recipe, I liked the idea of granola without oats or barley. I organized my ingredients while the oven was heating, shelled the pistachios, then toasted and remove most of the hazelnut skins, but did not toast them quite as far as you might normally because I knew it was going to go back in the oven. While I made this nut mixture exactly as specified by the recipe, if you were short of one of the nuts or didn’t like them you could easily adjust as long as the total amount remained the same. I was a bit short on dried cherries, so I made up the difference with dried cranberries, and added the zest of a small Meyer lemon as well as from a Sumo tangerine. Luckily this all fit a half-sheet pan (my largest, and the largest that would fit in my oven). After 45 minutes (stirring and leveling every 15), it seemed to need a little more time so I gave it another 10 minutes, then removed it from the oven and let it completely cool for nearly an hour. While it was not absolutely cold at that point, I had to pack it up for fear that willing tasters were going to demolish it! It is just sweet enough yet not cloying, and I don't think we will need to worry whether it will keep for 2 weeks. There is just no way it will last that long. It is terrific! I used the parchment to lift and break it up, and it yielded about 2 quarts. 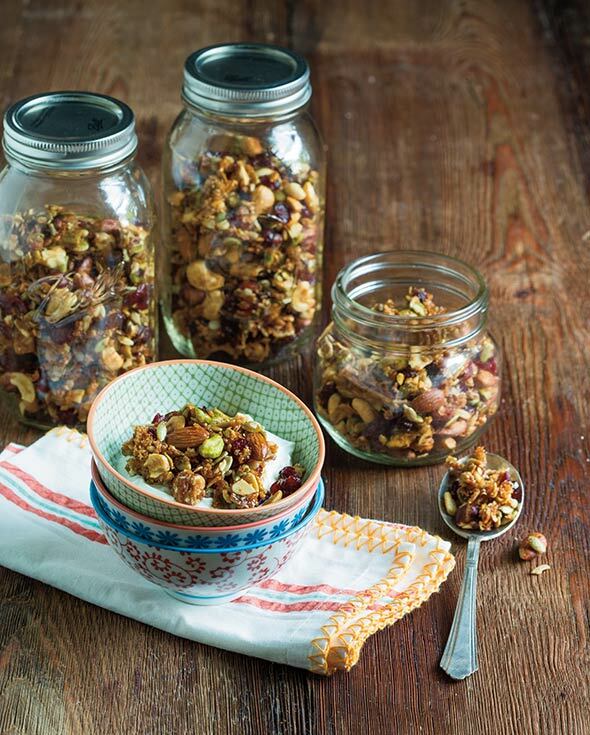 Great recipe for knowing exactly what is in your granola and choosing the best ingredients. Use it as a roadmap, play with the mix, maybe even slightly reduce the coconut oil and honey though it seems well balanced. Paleo, schmaleo. 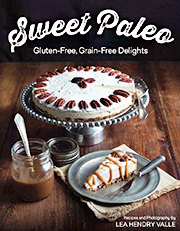 Can we just forget about the word "paleo" in this recipe title? And while we're at it, let's just sidestep the whole question of rather this version of granola is better or worse for you than the regular kind. Instead, let's get to the crux of the matter. Does it taste good? And the answer to that is a resounding yes. Even from a self-proclaimed granola-hater like me. This is a great snacking granola. It's basically candied nuts, with some fruit and coconut thrown in. What's not to like about that? I used a mix of dried berries that was mostly cherries for the fruit, and that was great, but I keep thinking it would be nice to try some variations, like maybe dried apricots. I did add the optional orange zest. My household was of mixed opinion on that. I liked it, while my husband thought the flavor of the zest was too dominant. Since he's the primary granola consumer in the house, I'll probably leave it out next time. The granola was very easy to break up. All it needed was a gentle crumbling with my hands. So good. So, so good. This is one of those recipes that is greater than the sum of its parts. Very much like a Kind bar (one of our favorite snacks), this is a low-carb treat, but not a low-fat one. If you're watching calories, you should definitely watch your portions of this addictively crunchy, sweet "granola." Still, it's a nice way to get nuts and seeds (i.e., fiber) into your diet. I could not find hazelnuts at my store, so I added extra almonds and cashews. For the fruit, I used dried cranberries, but the suggested dried cherries would be outstanding. The granola could also stand alone without fruit. I did include the optional lemon peel, which adds a sophisticated undertone, but the granola is excellent without it. The simple directions are spot on. You'll want to eat the granola right out of the oven—it smells so good—but after cooling for 15 to 20 minutes, the coating hardens and becomes brittle-like. This will go in my daughter's school lunch, and would make a lovely hostess gift. I will certainly make this again soon. I've always been a big fan of granola and eat some mixed into a bowl of yogurt and fresh fruit for breakfast almost daily. I'm also a junkie for nuts and reach for handfuls of raw cashews and almonds when peckish in the afternoon, so for me, trying this paleo granola recipe was a total no-brainer. Raw nuts are becoming easier to find these days (I get mine from Trader Joe's), and I'd bet that most home cooks have honey and coconut oil on hand, so access to ingredients shouldn't be too much of a challenge in making this recipe. The granola cooked up perfectly in the 45 minutes specified, with breaks for stirring at 15 and 30 minutes. My only caveat was that my half-sheet rimmed baking pan was crowded by the amount of granola being cooked, and the very center of the mass ended up being slightly chewy rather than crunchy as a result. I don't mind a little chew in my granola (its not a brittle after all), but perhaps I'll spread the nuts over a couple of sheet trays the next time to ensure that the whole batch ends up good and crunchy. That small issue aside, the granola is super tasty and not too sweet. The recipe is also a bit of a blank canvas and provides plenty of opportunities to customize based on nut and spice preferences, as long as the overall nut-to-liquid ratio is undisturbed. For me, the cashew, pistachio, almond, and hazelnut (raw with skins on, in my case) was ideal, as I almost always have these varieties on hand, but if you prefer others such as peanuts, pecans, or macadamias, live it up and have your way with this great paleo treat. This is the first official "paleo" recipe I've tried, and I must say that it's an excellent introduction to this increasingly popular cuisine. 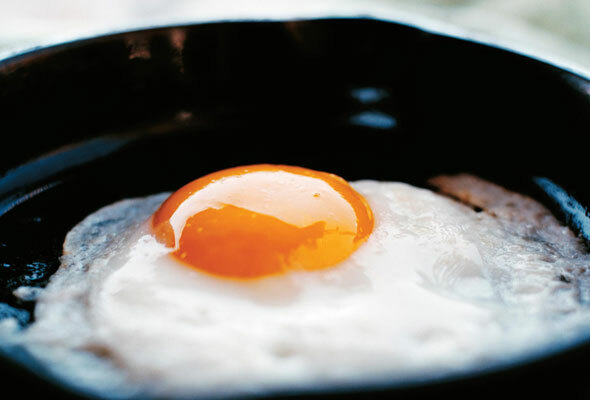 Not that I have anything against the paleo philosophy, it's just that I'm not particularly sensitive to wheat products and am pretty careful with my sugar intake as a general rule, so I haven't paid much attention to the paleo movement. Perhaps that will start to change now thanks to this recipe. This paleo granola is a delicious paleo recipe and very easy to make. You could definitely substitute whatever nuts you prefer and vary the dried fruit. I love the cherries with the vanilla and cinnamon flavors. I used raw hazelnuts with the skin on. I couldn't find raw sunflower seeds so I used roasted ones, and they seemed fine in the finished product. I used my food processor to lightly chop the nuts in 2 batches. I usually have nuts shooting everywhere when I try to chop them manually, so I opted to keep things clean with the processor. The granola was easy to stir in the oven and was perfectly done and light brown at 45 minutes. I let it cool for 45 minutes, and it crumbled easily and was crunchy but not too hard. I omitted the zest this time but will definitely add it next time. This stuff is amazingly delicious, especially after it sits for a day! After it sits the flavors really meld together. It has almost a buttery texture and the flavor of the hazelnuts really comes through. I can only imagine how delicious it would be sprinkled on some yogurt. I'm going to need to hide the container before I devour it all in one sitting. This granola is addictive! For years I've wondered if my family was part squirrel for all the granola and nuts they consume. At times I think we could have purchased a luxury car for all the money we spend at Fresh Market and Whole Foods keeping their favorites in stock. I've also tried so many, many recipes for granola and granola bars, so I knew this granola may be end up being "not as good as…" and to be honest I didn't intend to try it. Well, we ended up snowed in for 2 days and were low on granola. I always have a freezer full of nuts and had all the other ingredients as well so I decided to give it a try. The first thing that makes this paleo granola recipe stand out is the lack of oats or other grains. We aren't on the paleo diet, but I love the high-protein, low-carb snack option—it's a great way to have a healthy satisfying snack that won't leave you hungry again in an hour. The granola was barely cool, about 10 minutes after removing it from the oven, when my tasters started munching away. They loved that it's in nice size clumps that are not so big you want to break them before putting it in your mouth but not just individually coated seeds and nuts. The slightly sweet taste with the hint of vanilla is, in my testers opinion, the perfect complement to the nuts. It was agreed by all that this moves to the top of the granola recipe list. Watch out, Fresh Market and Whole Foods, this homemade version just moved ahead of the competition! This granola was quite good. It was easy to make and you could probably switch the various nuts and seeds to make it whatever you want. The one issue I had that made it a little difficult was that I baked it for the full 45 minutes and it was a beautiful golden color. However, it was a little tiny bit oily still. That was odd. It was also a touch salty for my taste (I used 1 teaspoon salt). I used hazelnuts but toasted and rubbed off the skin before starting. I also used dried cherries because we like dried cherries. I let it cool for about 1/2 hour before trying it. The granola was not so stiff that it couldn't be easily broken up to put into a container. I happen to like oats and could see trying this again adding oats (funny...not paleo then) and I could see putting in other fruit, as well. If I didn't use oats, I definitely would put less salt in and less coconut oil next time. I was genuinely pleasantly surprised that the coconut oil didn't overwhelm the granola, as it has other granolas that I've made with coconut oil. I suspect the great addition of both cinnamon and vanilla (two of our favorite flavors) produced this result and I may try using that combo with other granola recipes. Kay, a lot of folks prefer to simply eat mindfully and modestly and not bother with the numbers. We’re that kind of folks. That said, there are a lot of online calculators that help you easily calculate the nutritional breakdown of recipes you find online. I’ve heard good things about the Spark People calculator but there are tons others, too.